The Tour du Mont Blanc (TMB) is not only one of the most popular hikes in Europe but one of the best treks in the world! So How Did Planning our Own TMB Trek Planning Work Out? The 160km, 8000+ elevation gain trek around the highest peak (4810 m) in Western Europe is a classic! Having completed it through France, Italy, and Switzerland, I can highly recommend it. Although you don’t go to the peak itself (that involves mountaineering), it’s tough. It will challenge you both physically and mentally, but with a little bit of planning, you can choose how much of a challenge you want. BOOK BEFORE APRIL 15TH & GET OUR SAVINGS FARE! This is a good option if you want to leave the route-finding to a skilled guide and also want local knowledge. Our French guides will point out things along the way you’d never spot on your own. A guided tour is also a good option if you enjoy the camaraderie of meeting fellow hikers. Note: We need to confirm numbers for the accommodations by the end of March. And there are limited spaces so if you’re interested in a guided tour don’t delay your booking. Coco carried 7kg of each of his group’s stuff. He’s not fond of tomatoes but likes peaches and apples. 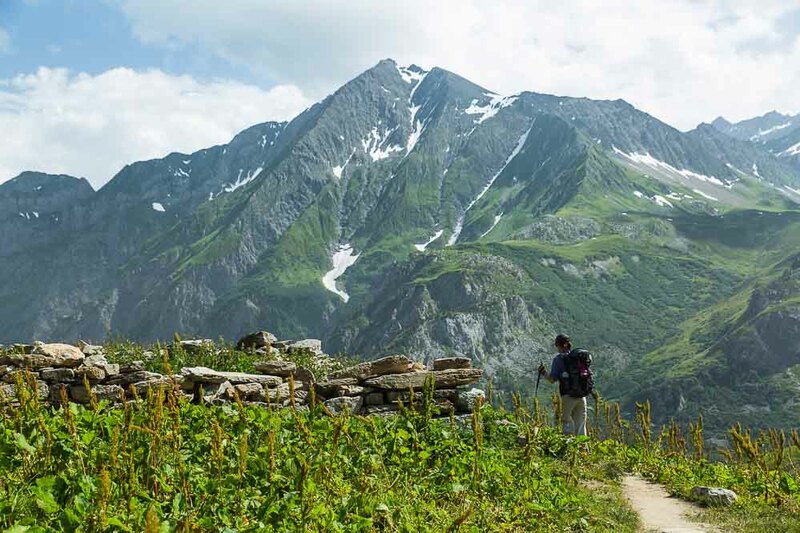 There are also self-guided treks of the Tour du Mont Blanc, in which a tour operator consults with you and makes all the arrangements best suited to your needs and wants. This is one of my favourite ways of doing treks. You can avoid the mistakes that we did by planning it all ourselves – see below. After booking this tour on my own, I now almost always choose the self-guided and sometimes the guided option. Because I’m such a big fan of self-guided hikes, we offer 6, 7 or 10-day tours. You choose whether you want to stay in huts or private accommodation. And you also have the option to carry your luggage or have it transferred. Self-guided tours are a good option if you want the flexibility of hiking at your own pace and starting when you want to. They’re also a good option if you want to spend quality time with the person(s) you’re hiking with. The TMB route is well-signed and we provide a detailed map and instructions but you still get to figure out a few things on your own, like whether you want to choose the easier or more difficult but more scenic path. I personally love this stuff. But I don’t love booking accommodations and trying to figuring out everything on my own from scratch. It’s very time-consuming. I’d rather rely on experts but then have the flexibility of hiking by myself. Another alternative is to plan your TMB adventure on your own. It’s the most time consuming, but also the cheapest option, especially if you’re camping. Below you’ll find the how to plan your own trek if you’re staying in mountain huts. If you choose the do it yourself option, I recommend that you plan it using a combination of this site, and the Tour of Mont Blanc: Complete Two-Way Trekking Guide Book by Cicerone Guides. And of course a good map. The site shows you the availability of the refuges (mountain huts) and how long it takes to hike to the other hut. You’re also able to book the huts directly through their site. This is very time-consuming. However, it has the advantage of being the second cheapest option for trekking the TMB. The cheapest option for doing the TMB is camping. However, as I didn’t camp, I, unfortunately, can’t offer any advice on that. 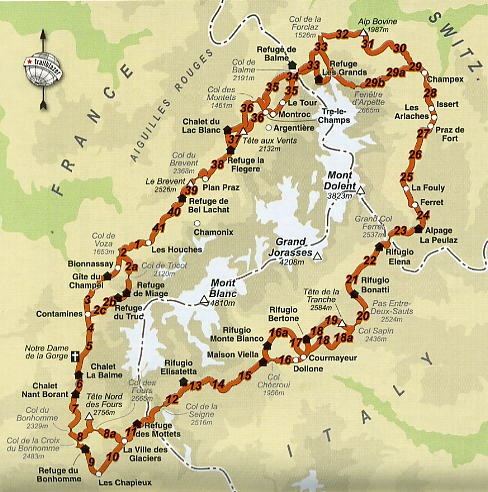 Map of the Tour du Mont Blanc 160km circuit. We started in Chamonix, known as the Capital of Extreme for all of its climbing, mountaineering and rafting activities. But it depends on the length of your tour. We start our 6 and 7-day tours in the nearby village of Les Houches. It’s also a popular starting point and easily reached from Chamonix. Travel tip: If you do decide to start in Les Houches ensure you buy everything you need in Chamonix first. We walked from Chamonix to Les Houches and had to take the bus back to Chamonix again to buy an iPhone cable. It’s a very small village where only very basic supplies are available. The traditional way is to do it counter-clockwise which is how we did it. The advantage of doing it this way is that you will keep running into the same people. If you want to hike with others, it’s easy enough to meet up. We did a combination of hiking on our own and with other people, we met on the trail, including a fellow Canadian! You can spend as much, or as little time with other people as you choose. It’s really up to you! Don’t start by saying that you will do the trek in so and so many days. Take a look at the itineraries for the self-guided and guided tours and see whether the 6, 7 or 10-day tour, is the best choice for you. On our tours, the 6 and 7-day tours are the easiest (although not easy). You take transfers skipping the less scenic parts. Our 10-day tour is the most challenging with more hiking and fewer transfers. 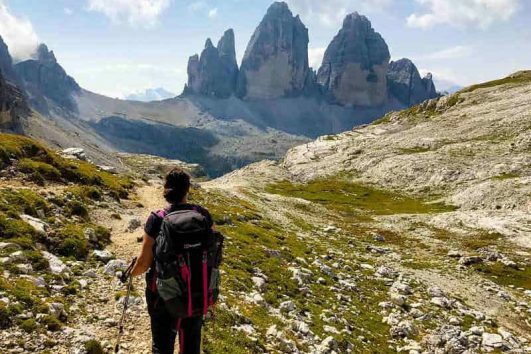 If you’re new to hiking and the TMB is your first long-distance hike, it’s a good idea to start with a 6 or 7-day tour in which you hike less each day. This is a good way to ease into long-distance hiking. The 6 and 7-day tours are also good options if you don’t hike regularly and are in OK but not great shape. If you’re in good shape, hike regularly and love a challenge, then the 10-day tour is an excellent choice for you. Of course, you may be limited by vacation time. In that case, even if you’re in excellent shape, you could still choose a shorter tour, then opt to hike some sections instead of taking the transfer. That way, you’ll make it harder. You can use these guidelines, even if you’re planning on doing the Tour du Mont Blanc on your own. The disadvantage to the TMB site though is that it doesn’t provide the elevation gain, nor the distance. It’s also only possible to book some refuges by phone. And the ones you book by email can be slow (if they bother) in responding to you. We called a few and found some didn’t speak English or German, the only two languages we speak. Also, each booking is dependent on each other. I.e. you want to have your reservation secured for Days 1,2, 3 before you book for Day 4. That way you ensure that you don’t have too short a day or too long. Furthermore, after we confirmed our booking, two refuges contacted us a few days later to tell us they were full. As a result, we had to start our bookings from scratch. This happened twice. It took me hours and hours to plan our TMB adventure, then replan, then replan our route again. It’s doable but very time-consuming. It took us approximately 12 hours to book and plan everything. And it was incredibly frustrating. That’s why if you’re short on time, I highly recommend doing a self-guided or guided tour of the Tour du Mont Blanc. You let someones else make all the time-consuming bookings for you. Note: even for us, the bookings are time-consuming. Sometimes we physically go to the huts to confirm a booking. After planning the TMB on my own the first time doing this once, I wouldn’t do it again. That’s why I started offering tours – to help make it easier for fellow TMB hikers. On future hikes, I used self-guided tours for hiking the Dolomites, Wicklow Way in Ireland and the last 100 km of the Camino de Santiago in Spain and from Dana to Petra Trek in Jordan I did a guided hike. BOOK BEFORE APRIL 15TH TO SAVE! Lastly, some of the mountain huts/refuges are nice, some less so. We stayed in a four-bedroom at one which was nice, but the dorm room was awful! The beds were both inches off the floor and from each other. Keeping in mind that you may be sleeping next to a stranger! We also heard horror stories of refuges that were filthy. We stayed in one in Switzerland after a 13 1/2 day of trekking that wasn’t exactly disgusting, but not exactly clean either. And the staff was unwelcoming. Neither helped my tired mode. Note: I am not able to tell you the mountain huts that I wouldn’t recommend. The last time I did the full TMB was several years and things may have changed. I’m also eager to avoid a lawsuit, which has happened to other bloggers who’ve said less than complimentary things about hotels (not on the TMB). It’s also as a courtesy to our clients who book their TMB Trek through us and are paying for our expertise. That’s another advantage to doing a self-guided or guided tour. We have the insider knowledge of which accommodations offer something special. And which ones to avoid! On some days of the TMB, you will have the option of an easier or more challenging route. On these days see how you’re feeling. I.e. how sore you are and how tired you are. Don’t be afraid to choose the easier route if your legs are burning or if you’re exhausted. It’s important to challenge yourself on multi-day hikes but without overdoing it. That can easily wreck the rest of your hike. It’s also critical to consider the weather. We had one day that I wanted to take the longer route. Unfortunately, the heavy rain made it inadvisable. It’s important to consider safety. Besides, if it’s raining heavily, you likely wouldn’t have the spectacular views that you were searching for on a more challenging route. When you’re hiking in the mountains the weather can change quickly. All the mountain huts will have the weather posted. If not you can ask. On days when a thunderstorm is predicted in the afternoon, you can get an earlier start and take a shorter lunch break to try to avoid it. You’ll mainly be hiking on well-marked trails through mountain passes, meadows filled with wildflowers and valleys. It’s absolutely stunning. 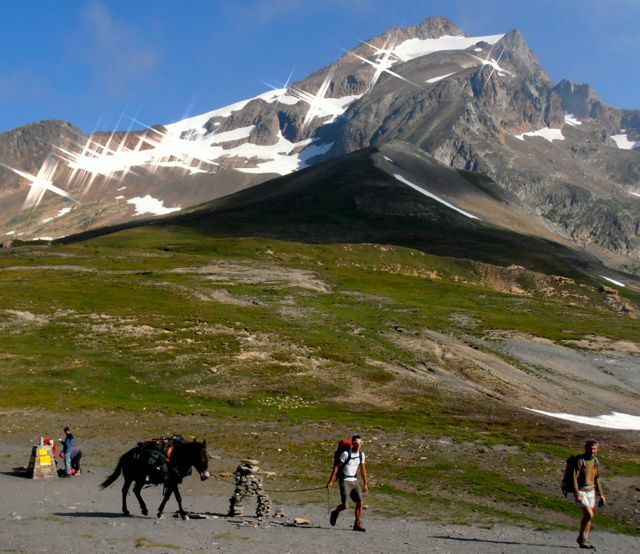 If you choose the 10-day trek, that often means going up two separate cols/mountain passes. Keep in mind that you will likely be much slower later on in the day when your legs are already tired. Also, remember to purchase Travel Insurance. You hope you won’t need it, but mountain rescues are expensive – a minimum of €5000. And they can easily be much more expensive depending on your location and the complexity of the rescue. I had a friend hiking in the Dolomites who required a helicopter rescue because she tore ligaments in her knee which required surgery to repair. Sometimes injuries aren’t life-threatening but if you tear ligaments, slip and break your ankle, you won’t be able to hike down on your own. It’s better to purchase travel insurance (being sure that it includes mountain rescue, and hope that you don’t need it. I’ve written a comprehensive post on this indicating every essential item while eliminating those that you don’t need. Check it out! This is NOT a recommendation but is what we did. I’m providing it as many of you have asked for our route. We had some long days, including a 13 1/2 hour one. If you’ve ever hiked for that long in the pouring rain, you know that’s not much fun. Again, I wouldn’t recommend what we did. If you’re looking for recommendations check out our self-guided and guided Tour du Mont Blanc treks. You’ll get an idea for a much better itinerary even if you’re not planning on booking our tour. Also worth noting is that our start to finish time includes a short lunch stop and breaks in between. We walked every kilometre and didn’t take any public transportation. I will take ten days when I hike it again. The times mentioned in the book and on the TMB site do not include breaks/stopping for route finding etc. Nor do they account for going slower on a long day. If it says 6 hours, you probably want to calculate for somewhere between 7-8 hours. Possibly even longer. We had one long day listed as just over 9 hours of hiking. That seemed long but doable. It ended up taking us over 13 1/2 hours (including breakfast and a lunch stop). By the time we finally hit the second bit of elevation, we were already 22km into our hike. We did the remaining 700m of elevation at a tortoise pace. It rained the entire day and we didn’t see Mont Blanc once in the 13 1/2 hours of hiking. Several years later, I look back on that day and still shudder. Anyone who was familiar with TMB Trail would have known that trekking from La Fouley to Trent was not a good idea. That’s especially when you’re carrying a heavy backpack with all your belongings. I have a gluten allergy and told all of the refuges before we left. Despite that, two of them claimed to be unaware of my allergy. My guess is that they were either busy and forgot. It’s also possible that the language barrier played a part. Note French, Italian, and German are spoken with varying degrees of English depending on the mountain hut. One place made up for it quite well. While another one served me a salad. Safe to say that it didn’t exactly hit the spot after hiking for hours. It was also a problem at breakfast where typically just bread was served. None of the refuges had gluten-free bread. Instead, I requested a piece of fruit. We ordered lunches to go the night before from each hut. Despite being informed ahead of time, lunch was usually sandwiches which I couldn’t eat. As a substitute, I’d be given 3 or 4 apples instead. If you have any special dietary needs, many of the mountain huts won’t be able to accommodate them satisfactorily. In this case, I highly recommend the private accommodation option versus the mountain hut option. You’ll be staying at more hotels/inns. They’re better equipped to handle dietary preferences. At the mountain huts, there are are two options for dinner. A regular meal and a vegetarian one. The same three to four-course meals are served for everyone unless you make special arrangements. You can find out more about what it’s like to stay at a mountain hut here. Relaxing at Fioux Refuge and enjoying the views of Mont Blanc. As we planned our trek ourselves, we reserved all of our refuges along the TMB in advance. We wanted to enjoy our holiday. And not be on our phone each day trying to call ahead to see if there was space. We also didn’t want just to show up and find out there was no space left. The disadvantage of this is that it allowed us no flexibility. The advantage was that we never had to worry about finding a place to sleep. And – in theory, each place knew in advance about my gluten allergy. As it turned out, all of the refuges we stayed at, did have space. Reservations may not always be necessary, but often the only space left was in a dormitory, and we preferred to sleep in private rooms when possible. Update: Since I did the TMB several years ago it’s gotten much busier. The mountain huts are often booked months in advance. We sometimes have difficulty finding space as early as March for July dates. I highly recommend booking in advance. Travel tip: If you don’t have reservations for a mountain hut, then try to get an early start and arrive early. That way you may get a spot before it does come full with other hikers who have the same idea. View of Mont Blanc from our room at Boutique Hôtel Le Morgane in Chamonix. We stayed at the Hôtel Les Aiglons, Resort & Spa the night before our trek and at Boutique Hôtel Le Morgane on the last day of our trek. Both are four-star eco hotels in Chamonix, complete with a spa! After staying in refuges, it was pure bliss. 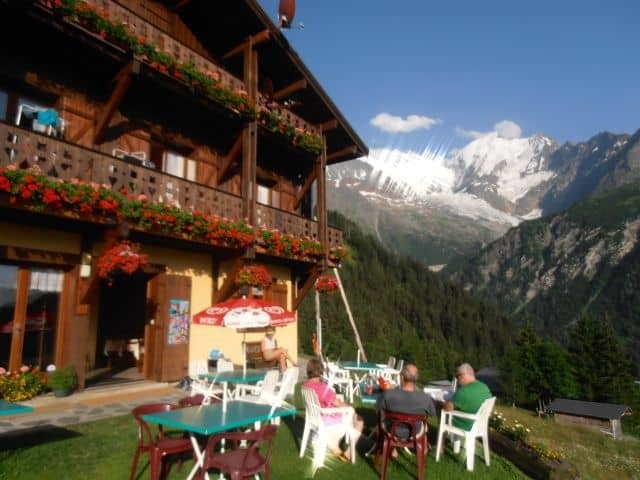 We sat on our huge patio enjoying the killer views of Mont Blanc, as we rested our blistered, aching feet. Trust me, on the final day; you’ll likely be tired, so it’s worth a bit of a splurge! Overall it worked out OK for us. We did it in 8 days. If you want to do the full route I’d recommend 10 days. We did have several long days, which were manageable, but our 13 1/2 hour day was way too long. I was THISCLOSE to calling a taxi for the last 3km but sustained. In truth, my partner at the time wisely prevented me. It would have been nice to have had an extra day or two. That would have significantly reduced the hours we hiked on some of the very long days. I liked all the refuges we stayed in, with one exception. The sense of accomplishment. Knowing that we did it. And enjoyed most of it. I don’t believe anyone who says they enjoyed every second of the TMB. There are some tough parts! And there are times you may question why you’re doing it. Even better, it left me a lasting gift that is still giving. The gift of personal strength, both on and off the mountain. Check out How a Hiking Trip Can Change Your Life. 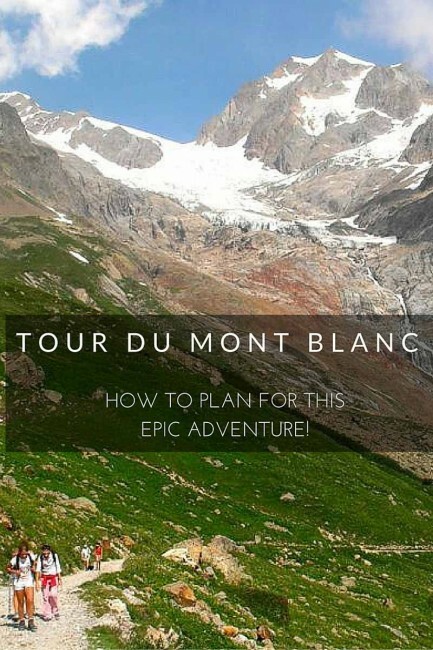 Check out my Tour du Mont Blanc Packing List! Note: Originally published in 2013, updated in Jan 2016 and most recently in Feb, 2019. Congrat for finishing the TMB, it has been on my list for a while. Question: did you see any kids doing the TMB while you were trekking ? @John - Thanks so much. I only saw 2 kids doing the entire trek and they were having a great time singing. I did see other families hiking, but they were doing day trips. If you need any further info let me know. I'll also be writing more about it. Congrats on finishing this hike! I saw you posting about it on FB the other day, and I was pretty impressed. I'm not into hiking, but it looks like you had a great time despite the long days. Way to go! It seems much easier to plan TMB than Alta Via 1. It's nice there is a central website to book all the refuges. That was a challenge for Alta Via 1 because every single one had to be Googled individually. Looking forward to seeing more of your photos! @Jennifer - Thanks. That definitely sounds like a challenge, plus it can be difficult to figure out how far one is from the next one in terms of hiking. I was running into the same thing until I discovered the TMB site. It's not perfect, but definitely makes things much easier. Thanks for the post! Mont Blanc is awesome beyond belief. My family is from the region, and my mother used to go to mountain summer camp. We go back whenever we're in Italy, and I must say that as many times as we've gone up there, we've never made the loop around. I'm stoked now. Gonna absolutely do it next time! @Life Leaps - Agreed, Mont Blanc is incredible. You're lucky that you have such a strong connection. Definitely recommend doing the tour, gives you a new appreciation for just how big the massive actually is. I have the book (Cicerone) and the map and all of the other equipment. Just waiting for the go ahead from my other half! @John - Sounds like you're all set. Hope you're able to go soon. I think you'd love it. What an incredible experience! I can't even imagine hiking for that many days and I don't think my kids would have any part of it but I would love to do some day hiking in that area. @Lisa - It was the longest I've ever hiked as well, I'm more of a day hiker, but there are some great day hikes along the way and we saw quite a few kids doing them as well. What an inspiring post! Congratulations on completing this amazing hike. I've been thinking of planning just such a hike for a birthday milestone - my 60th, which thankfully is not for another 8 years. I'll be keeping this post as a reference. So now I have to keep attending my weekday exercise boot camps, plus I better start adding regular hiking around Flagstaff and Sedona to prepare. Thanks so much for the lovely photos. @Roberta - Thank you! The Tour du Mont Blanc would definitely be a great hike for a birthday milestone. We hike regularly on weekends which definitely helped us prepare. Your article is a fantastic resource and is chock full of very helpful information. I would love to do this trek and greatly appreciated your suggestions in terms of web resources, books, accommodation, booking in advance and start points! Thank you! It looks like an amazing experience - phenomenally beautiful region and great shelters along the way! @Mary - Thanks so much. Glad it was useful and I highly recommend it. It's a great way to appreciate such a beautiful area that changes along the way. Congratulations to the both of you for completing this trek! Looking at that map made me a bit exhausted already :) The scenery is just gorgeous and to be pampered before and after in those refuges I'm sure helped a lot. I can't imagine doing this hike with kids but it sure looks worth it. Love how the white looks like they're sparkling on some photos. Great tips and resource here, Laurel. Wonderful to see a triumphant picture of the happy couple. What an awesome experience. Well done! Tour de Mont Blanc is on my list, but probably in segments over a longer time - some with and some without kids, probably. Will definitely look to your blog for tips when we do; very useful this. @Sophie - Thank you. It's definitely easy to do the Tour du Mont Blanc in segments. My favorites were the last stretch in France and the parts in Italy. We saw quite a few kids doing day hikes, but only 2 kids who were doing the whole tour. That is quite an elevation gain and sure to be a tough climb, but it is well worth it for the view and the sense of adventure and accomplishment. @Yana - Thanks for stopping by. Great minds think alike. Let me know if you're ever in the Alps area. I'm based in Munich. Congrat for finishing and thanks for great info, thats what I am planning for next year hopefully. @Eray - Thank you. If you need any advice for planning your trek, let me know. We are in the beginning stages of planning. Our plan is for July, 2014. My wife is a teacher and July/Aug are the only times she can get off. I ordered the guide book last week, should be here any day. Where is a good place to get a map? I am unsure as to guided or on our own. We did the Camino this past summer, St Jean-Santiago, and wouldn't have considered guided or any help. It is a different type of experience. Your thoughts on pros/cons would be greatly appreciated. The biggest being cost...we probably can do it for 1/3 the amount. Any tour groups you would recommend? @Marty - We did it ourselves without any problem. The website I listed above to book accommodation is really helpful and makes it easy for you to determine how far you want to walk each day. We bought our map in Germany (in German) at an outdoor store, but I'm sure you could find one online. Can't recommend any tour groups as we didn't use one. Awesome, I would want to make it to the peak though. Being at the peak just makes it feel like you're on top of the world. Great advice. Well done on doing it. It is some trek. I actually went to climb Mt. Blanc 2 years ago but due to snow we had to settle for Gran Paradisso in Italy which was a cool mountain to get to the top of. Not as high as Mount Blanc but a guide is still recommended though if you havent done it before. Thanks for the recommendation Ross, I'll have to check Gran Paradisso out. Looks like an awesome mix of outdoor adventure and European class and luxury. I'll have to try this trip out in the future! Great, thanks a lot for sharing this! I plan to go this August or September, hope it will be not too crowded! Is tent camping not allowed? @John - It is, but only in certain places, so it's good to have a guide book or do research prior to going so you know where you can put up a tent. Hi Laurel, Thank you for sharing this! I really enjoyed reading your article. You wrote that you completed the TMB in 8days, did you write about the itinerary you followed anywhere for reference? I am thinking of completing the tour in 8 days as well but am quite worried if it's too short. About how much time did you take per day to reach your destinations? @Michelle - I took anywhere from 4 hours to 14 1/2 hours (that was a brutal day), but the average was around 6 to 8 hours. Best of luck! I really want to do this trail but none of my friends want to bring their gear while we walk around Europe. Do you know if you can either ship things somewhere or rent gear there? If they don't want to go would i still be ok doing it myself? Thank you so much for your help i will be studying in England all next year and am looking for trails to do. @Alex - I'm sure you could ship gear to somewhere in Chamonix. If you stay in the huts, all you really require is a large backpack, hiking boots, sleeping bag slip cover (hardly takes any space) and your hiking clothes. You'd be fine if you decided to do it alone. I met many people who were also doing it alone and you'll meet people along the way. You guys rock! Congrats! What time of year did you go? Was there a lot of snow, cold weather? Where were you when you did the 13.5 hour day so I can avoid that ( you are awesome for making it through that). Between what cities are the hardest a parts of the trail- elevation and strenuous effort wise? Thanks!! Hi Reid, We went at the beginning of August and the weather for the most part was warm, although we did have a couple of rainy days. I've updated the post, so that you can see how to avoid a 13.5 hour day like we had, along with the elevations, kilometres and time we spent hiking each day. Hope that helps. The TMB is one of my favourite walks and I would strongly recommend early September as the best time to go. There are fewer people than in August and the refuges are still open and almost always have places. I lugged a Nikon D300 around with me and was fortunate to have some great weather. @Jeremy - Great tip, thank you! I did the trip last year and it is of course one of my favourite walks too. @Tobi - Glad to hear that you enjoyed it as well! the TMB really is a fantastic trip! When did you start booking the accommodation? You think it is to early to start now ? @Anca - We booked ours only a couple of weeks before, but I recommend booking earlier, since the nice huts fill up, or if you want a semi-private room, since those also fill up quickly. Hi. We are planning to hike Mont Blanca the first week of August, 2018. We want to stay in a hotel in Courmayeur, any recommendations? @Para - You can end up in towns/villages each day, but you have to take public transportation to reach them, then take it back to the trail each day (we provide directions on how to do this with the self-guided tour we offer). When my husband and I did it, we stayed in mountain huts and only visited towns/villages that were directly on the route. The site we used to book our huts is listed in the post. @Fernando - Yes, they have plugs to charge devices, the challenge is that everyone wants to charge their devices and there are more devices than plugins. To get around this, it's not a bad idea to bring in an extension, where you can plug in multiple devices to a single outlet. Hello, As serious and highly experienced backpackers used to hiking in the Rocky Mountains of the USA, we are seriously thinking of doing this trek in late Aug- early Sept 2016, to celebrate 40 years of marriage!! However, we we want to stay in our own tent occasionally to avoid dorm style nights and want to extend the trip to 14 nights. Is that possible? Any help or suggestions would be greatly appreciated!! @Arden, Congrats on 40 years of marriage, that's fantastic! Yes, it's possible to stay in your own tent. There are usually camping spots near the huts where you can set up your own tent and then take as long or as short as you want. The book I recommended in the post has more info on camping. I stayed in the huts, so I don't know the exact details, but did meet people along the way who were camping. Great post! Planning on doing TMB this summer with my husband except we will be camping the whole thing. Thanks Karen, and best of luck! I'd love to hear how your trip goes! Hi! Great Article:) Any suggested transport options from Geneva to starting point in Saint Gervais les Bains? Thank you! @Meredith - Thank you! There are shuttle services available directly from Geneva airport to Chamonix, or to the nearby village of Les Houches. From there, you can either take the Mont Blanc Express Train or the Chamonix Bus to the starting point of Saint Gervais. @Weon - I didn't take a bus in Switzerland, but I know they exist, as the tour co. I work with offers it as an option for our clients. You could ask at one of the refuges that you're staying at. Best of luck! I am not really sure If I will be able to make it but my husband definitely will be thrilled doing this. Hope we can go back and include this one in our itinerary. @Lady Hope that you and your husband are able to do it. It's a great way to reconnect with each other. My husband and I were much closer after doing it together. Hi! I am wondering how much experience i need to have to do this walk? I completed El Camino last year from SJPDP, so i know i can walk for days on end..? I am looking at doing a guided tour. @Cristina - If you did El Camino you'd likely be fine to do the Tour du Mont Blanc. I would just recommend training for elevation since you'll be doing more elevation on the TMB each day than what you do most days on the camino. Hej Laurel, For which period on the year have you done the TMB ? I planed to do it with my son who has 14 the 7 last days of june. Do you think we need to reserve our refuges even for this period in advance ? @Francois - I did it at the beginning of August. I would definitely reserve your refuges in advance as we've had difficulty in finding suitable accommodation for some clients who are starting their trek the end of June. Have a great trip. I'm interested in knowing how much euro to bring? On average how much did you spend per day/for the whole trip? @Becca - Assuming that you've already paid for your accommodation and it includes breakfast and dinner (if not you'll need to bring cash to pay for it as most places don't accept cards), plan to spend ~ €15 for lunch each day, plus extra for snacks and up to €50 for lifts and public transfers for the entire trip. Have a great trip! Hi! I'm having some problems booking a refuge around Trient and Col de Balme, I'm going around mid July. I was wondering if it was a safe bet to just go without a booking at that time of year or will I be left stranded with nowhere to sleep? @Nathan - I personally prefer to book in advance since July and August are extremely busy. Best of luck in finding accommodation. Hi Laurel, thank you very much for such detailed TMB description and answers in the comments! I believe they are already very useful for me! :) But I'm now looking for the information about what type of the sleeping bag I will need to stay in the refuges along TMB? Are they usually warm enough to have a blanket sleeping bag or should I use real touristic one? I'm planning to do my trip in the middle of August. Glad it was useful. You'll be fine with a sleeping bag liner (which is really thin) as the refuges provide warm blankets. I'm always cold and I was warm with the blankets provided. Enjoy! HI! If I do a self guided tour where can I rent a donkey? Also, how much do they cost per day? Thank you! @Sarita - While we don't offer services with donkeys, I know that it's possible to hire a donkey to carry your luggage but not sure about the costs or who is offering this service. Best of luck. It's an incredible trek. I will be recommended This trip to my Travel blogger friend, He is looking for A great tour for 2019 June or July month Travel. Thanks so much, appreciate your recommendation!